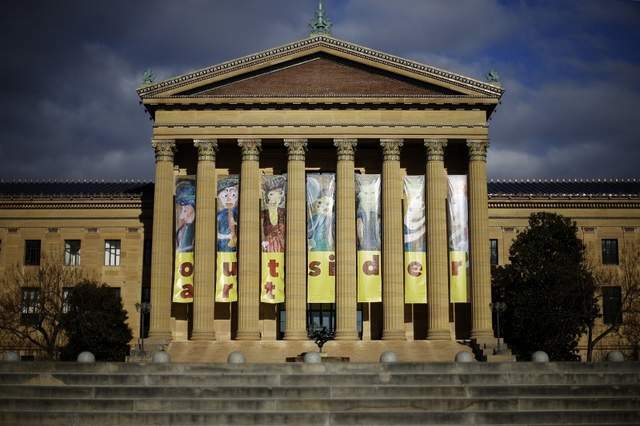 PHILADELPHIA — The Philadelphia Museum of Art, home to thousands of works by history’s most esteemed fine artists, is presenting a new exhibit that celebrates the contributions of artists who had no formal training and worked outside the boundaries of the art establishment. There are more than 200 widely varied works in the Great and Mighty Things exhibit, including paintings, drawings, sculptures and other objects made by 27 self-taught artists from 1930 to 2010. All are owned by local collectors Jill and Sheldon Bonovitz, who bequeathed to the museum the works they’ve collected for 30 years. “It is a gift that is both transformative and also forward-looking in establishing this institution as one of the leading centers in this country for the study, acquisition and display of works of this type,” Timothy Rub, the museum’s director and chief executive officer, said Friday. Outsider art is generally defined as work by self-taught artists who operated outside the mainstream art world. Many were unknown to the art world during their lifetime, lived in rural areas and worked with salvaged materials. The Bonovitzes began buying outsider art before it was generally considered collectable, and they just bought what they liked. Consequently their collection includes both widely known names like Howard Finster and Sister Gertrude Morgan, along with less recognized but equally remarkable works like the jewel-bedecked assemblages of Simon Sparrow, bold expressionistic paintings of Jon Serl and the mobile-like so-called healing machines of Emery Blagdon. The works in the show are grouped by artist because they are very diverse and have little in common with each other stylistically. The first piece greeting visitors is a tower of chicken bones by Wisconsin baker Eugene Von Bruenchenhein, and the last is a vivid green tower painting by William Hawkins. Also on view are large and intricate drawings by Martin Ramirez, who spent much of his life in a California mental institution; modernist silhouettes of people and animals by Bill Traylor, born a slave in Alabama who started painting in his 80s; limestone carvings by William Edmonson, considered one of the pre-eminent outsider artists; and stitched paper assemblages by James Castle, who drew on scrap paper with ink made of soot and saliva. All are recognized as important not only as self-taught artists but in the larger context of contemporary art. Great and Mighty Things will be on view through June 9.